Hello, my name is Beatrice and I am looking for a forever home to call my own. I am currently at the Chatham County Animal Shelter waiting to meet my new family! If you are looking for a new companion to spend your days with, please come to meet me! Beautiful Beatrice wants to go home with you. "Visit me at PetSmart in Apex at Beaver Creek Commons April 1 thru April 7. Come visit me today! I am dying for you to scratch my head and love me." Hi, my name is Jellybean, and I come dressed in a silky, shiny black tuxedo. Don't let the formalwear fool you, though, because I am sweet, playful, and cute as a button. Lately I've been developing a fondness for curling up in a warm lap, so be warned: Once we get to know one another, I plan to snuggle up. I might be a little shy at first, but break out the toys and the chin rubs, and I'm all yours! Be prepared for a rollicking good time with me in the house. I love to play, and playing fetch is my favorite game of all. I like to chase mousies, crinkle toys, jingle balls, fluffy toys, and almost anything else that I can carry around in my mouth. Perhaps the best thing about play time is that I make the sweetest little chirping noises. If I wake up and find that I'm alone, I'll start chirping and running through the house to find someone to play with. I've been told that I'm a real Chatterbox, and what can I say? I'm just so happy that I have to tell everyone about it! If you check out my photographs, you might notice that I seem to look surprised in them, but that's just the look I get when I'm in the middle of a crazy good time. You might also notice the distinctive markings on my face. In addition to contributing to my good looks, they tend to make me look as though I am grinning, which is convenient because I usually am. That's just part of the fun, after all. My foster parents say that I'm a bit of a character, and I suppose they're right. In my foster home, there are kittens, grown-up kitties, and a very mellow little dog, and I am comfortable with all of them. I hope to be adopted with my sister, Vee. We've been together since birth, and I would miss her if we were separated. If you were able to adopt only me, know that I would need another playful kitty or human to keep me company. I am very, very playful, and I wouldn't do well if left home alone all day. Adoption planned for April 5th. Hi, I'm Gracie. A nice lady let me in her house when it was very wet and cold. I was dripping wet and very hungry. She fed and dried me off and made me a soft warm bed. Later she took me to the vet and found out that I was super healthy. She named me Gracie and talked to some people about finding me a forever home. Now I am staying with a nice lady who grooms dogs and boy is it a fun place! Lots of cats and dogs and everybody is healthy and happy and the dogs bark a lot but it is very quiet at night and at night it is just us cats!!! I am FIV/FeLV negative, microchipped, up to date on vaccines and spayed. Click on my photo for some fun pix. 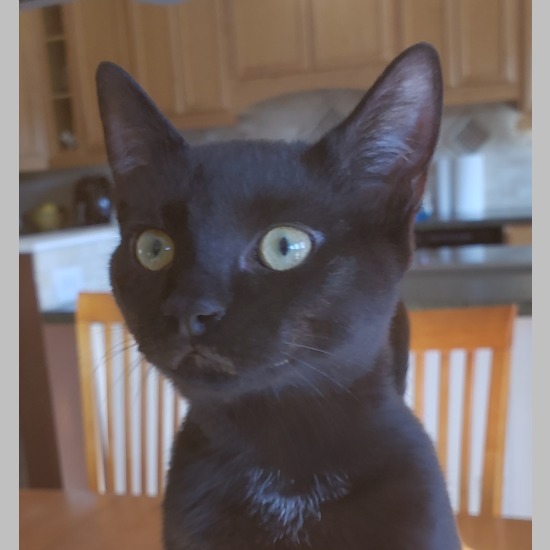 Gracie is an active, energetic girl who needs a kitty pal to play with. Hi there, I'm Blackberry! I'm a fun-loving boy. I was raised as a bottle baby, so I'm very close to my humans, and I love the other cats and dogs in my foster home too. I am best friends with my dogs, check out my video to see me playing with our puppy! I run right up to the friendly adult kitties and head bonk them until they give me kisses. I also know which grumpy cats to stay away from, I've learned that a respectful distance is best with those ones. My very favorite toy is Da Bird, have you seen that thing? It's just like there's a wild bird in the house, and I can make amazing leaps in the air to catch it! My mom says I'm an amazing athlete! 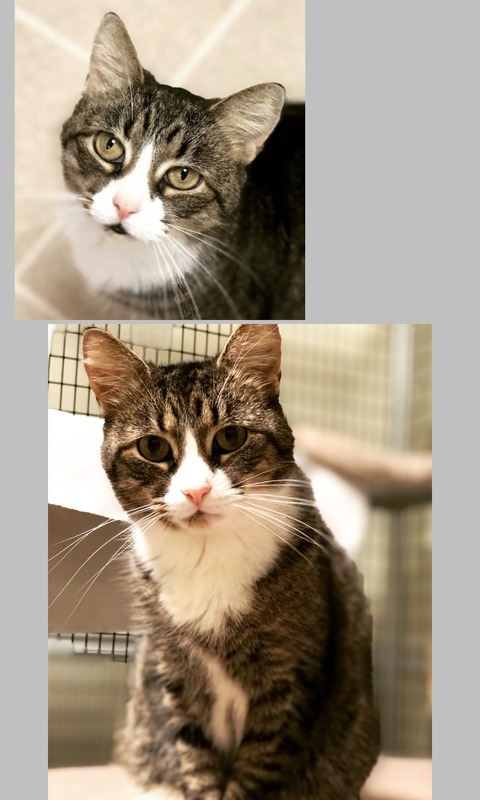 I would love an indoor-only home with another young kitty and/or doggy companion, as I am very social and I love the company of other animals. The very best would be if I could be adopted with my brother Chip as we are such very good friends. We promise to keep each other entertained (and we'll entertain you too, of course!). We can wrestle for hours, and then we sleep in a kitten pile until it's time to play again. 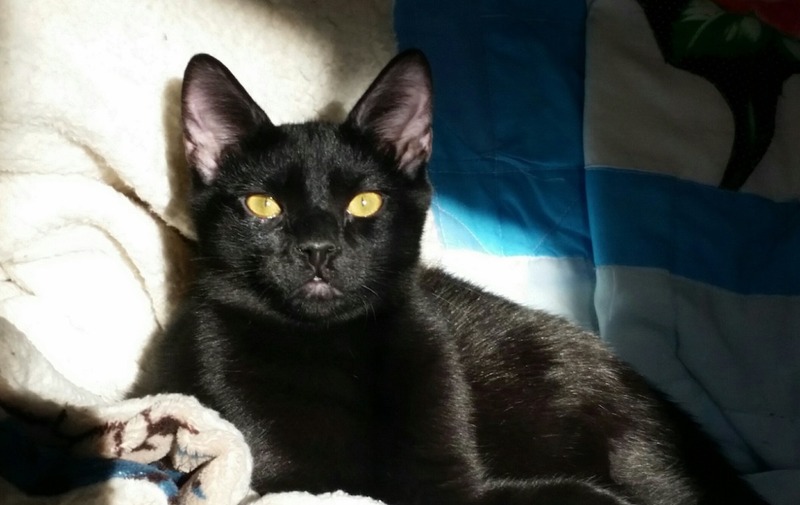 I have a sleek black coat and a beautiful dark brown face, with a tiny white spot on my belly. I really like to eat, and my foster mom thinks I'm going to be a big boy when I grow up. I am neutered, up to date on my shots, and microchipped, so I'm ready to meet my new family. Don't wait, contact my foster mom today to see if we might be a match! Hi, my name is Chip! I'm a super sweet snuggly fellow. I came into foster care at the young age of 4 weeks, and I was bottle fed at first, so I think my foster mom is my real mom! I've been raised in a house with lots of cats and dogs, so I enjoy the company of other animals, and I think hanging out with my humans is the best. I'm a friendly guy who starts purring very loudly as soon as you pick me up and I'll cuddle up right under your chin! My favorite things to do are wrestling with my brother Blackberry, climbing up and down my cat tree, and taking a nap on someone's lap. I'll even give you a little bath if you want! I especially love sleeping in the bed with my humans at night. Check out my video where you can see how super sweet I am! 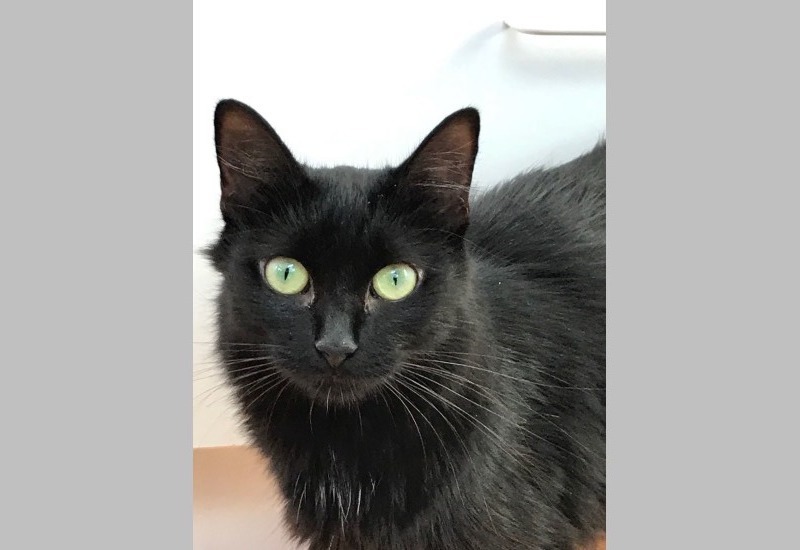 I would love an indoor-only home with another young kitty companion, as I am very social and I love the company of other cats (and dogs too!). The very best would be if I could be adopted with my brother Blackberry as we are such very good friends. We promise to keep each other entertained (and we'll entertain you too, of course!). I have learned to be respectful of the older kitties in the house, as they are not always impressed with my shenanigans, so I give them plenty of space when I'm romping around. 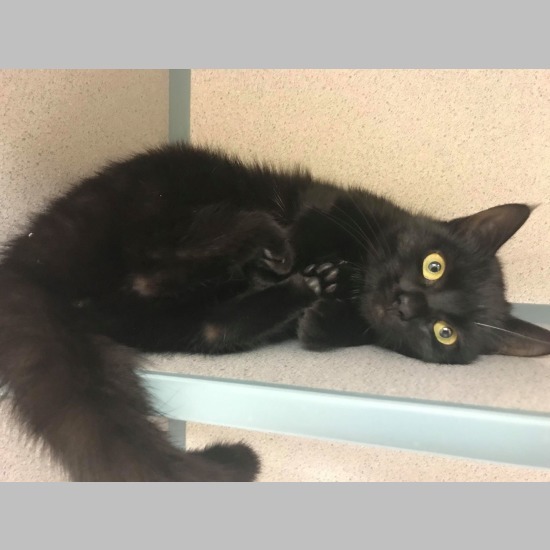 I have a beautiful black coat with a white spot on my belly and a few white hairs on my chest, and I have beautiful eyes. Black cats are known to be wonderful companions, and I am the perfect example of that. I am neutered, up to date on my shots, and microchipped, so I'm all ready to meet my new family. Don't wait, contact my foster mom today to see if we might be a match! 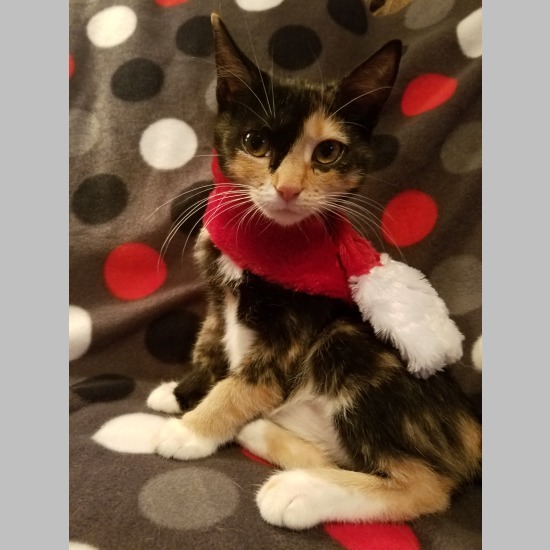 Pansy had a pretty hard time gaining weight and growing for her first few months. She is a chubby, healthy kitten now, but still a little behind her brothers in feats of strength. She is catching up every day, and won't let them get anything over on her. 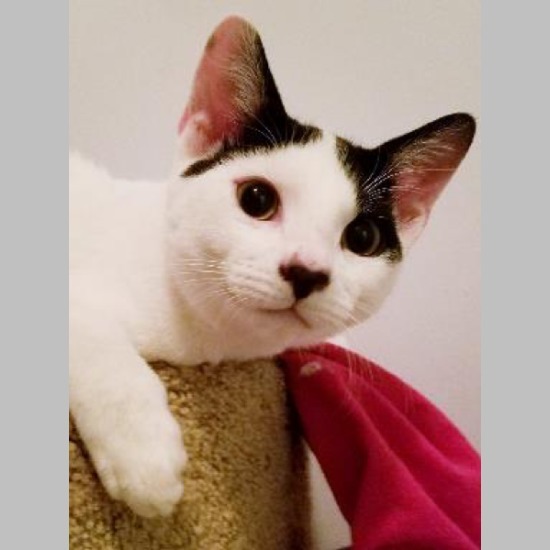 If you're looking for an adorable and charismatic addition to your family, you have to meet Miss Pansy! Sebastian is a lover of lovers! As soon as Sebastian sees you, he demands love and affection! He feels it is his right, as a 6 month old kitten, to garner ALL the attention. He is a lap kitty, so be forewarned! He loves to burrow under blankets and leap out at this siblings and his 10lb doggy foster brother. He LOVES his foster canine friend and you will find him rubbing, kissing, attacking or even cleaning the foster dog's ears on any given day. Sebastian loves to play with his siblings and zoom throughout the house, always on an adventure of discovery! He has a very loud purr and when he is super content will suckle on his large, stuffed duck. He would do best in an indoor home with another playful cat and even a cat loving dog would be wonderful for this boy. All children in the home must be 6 yrs older and older. 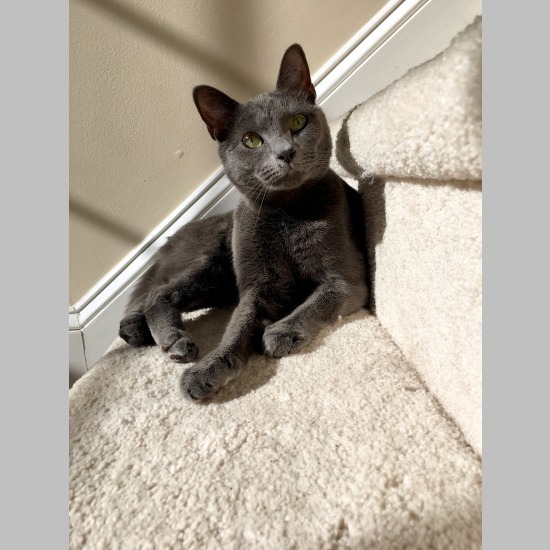 Sweet Lila is a beautiful russian blue mix! She has plushy grey fur that's a delight to pet, and a cute grey nose. 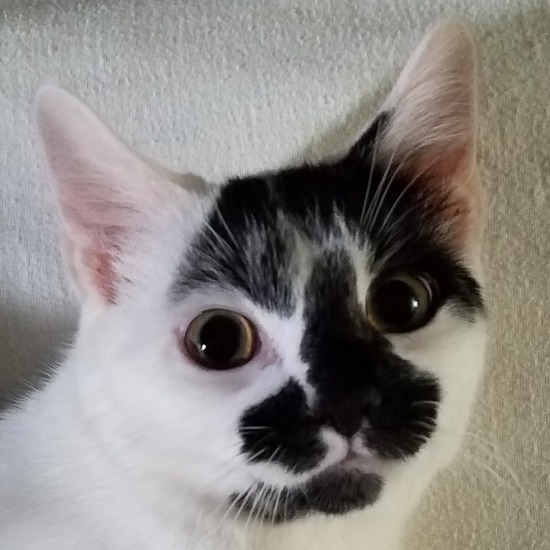 She's shy and reserved when meeting strangers, but her true personality is a little goof ball that has a range of chirps, thrills, and tiny but insistent mews...that's all directed towards food. Though she may have a giant love for canned food, she also loves belly and nose rubs, and chin scratches. She would be a wonderful companion for anyone willing to give her time to open up. She loves her sister Lillie, friendly dogs, and confident cats. Hello, my name is Sushi and I am looking for a forever home to call my own. I am currently at the Chatham County Animal Shelter waiting to meet my new family! If you are looking for a new companion to spend your days with, please come to meet me! Adoption Pending, Hooray for Sushi! 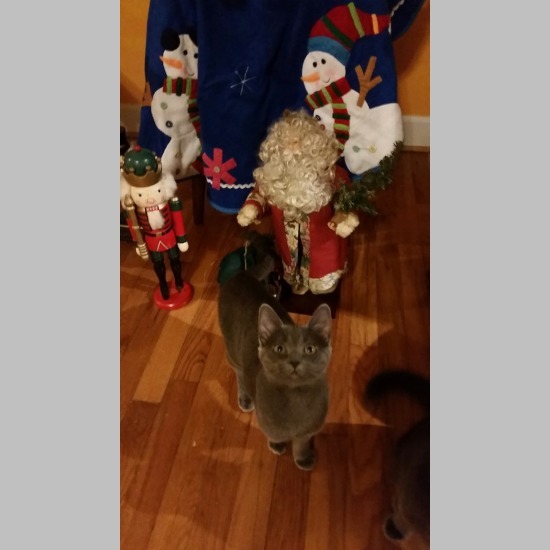 My name is Peek, and my foster parents say that I'm inquisitive, playful, cuddly, and snuggly--a total bundle of fun. 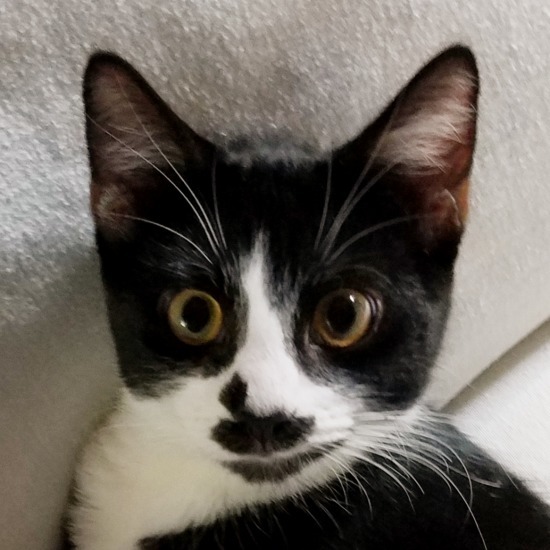 I'm quite the ham, chasing, pouncing, and tumbling about, and my crazy antics are sure to keep you in stitches. After a bout of hard play, I love to settle in for a nap by getting pets and belly rubs. Check out my other pictures to see me in all my cuteness. As to my background, my siblings and I were born among a colony of cats living outdoors that is being looked after by a couple of very nice humans. While trying to get members of the colony spayed or neutered, the humans scooped us up and helped us become indoor kitties. 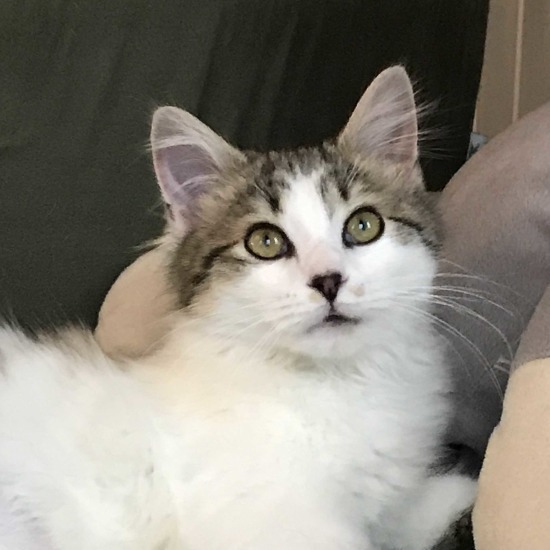 The humans are now our foster parents, and although they love me and will be sad to see me go, I know that they will be thrilled to see me settled in a loving, forever home. There are kittens, grown-up kitties, and a very mellow little dog in my foster home, and I am comfortable with all of them. 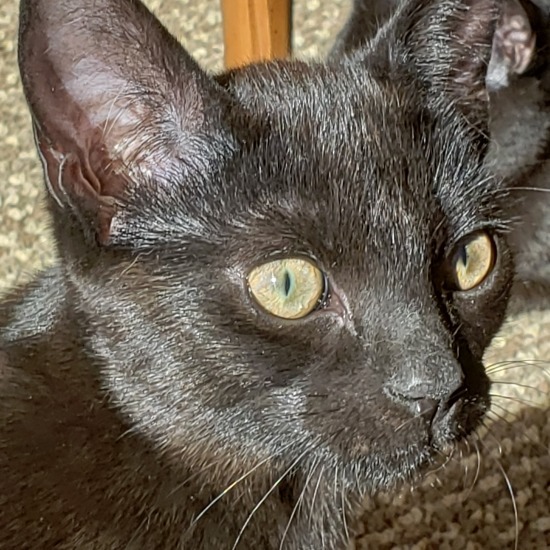 I hope to be adopted with one of my siblings, particularly my sister, Cinder. My siblings include Cinder, Jellybean, and Vee, and I have a foster brother named Scooter. 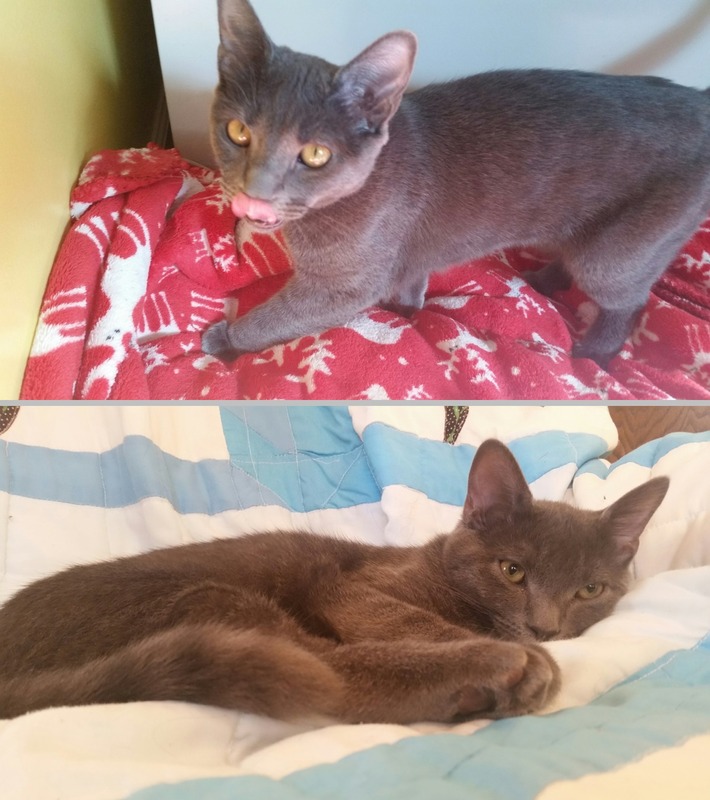 We are all super cute and would instantly fill your home with love and laughter! 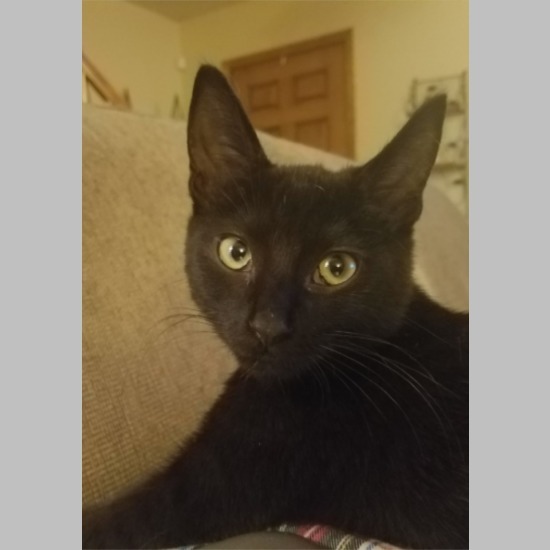 Peek would like to be adopted with one of his siblings, especially his sister Cinder. Hello there, nice human. My name is Cinder, and being quite the charmer, I am sure that I can win over you and yours with just one snuggle. From my photos you will see that I am very pretty, but I am much more than my good looks. 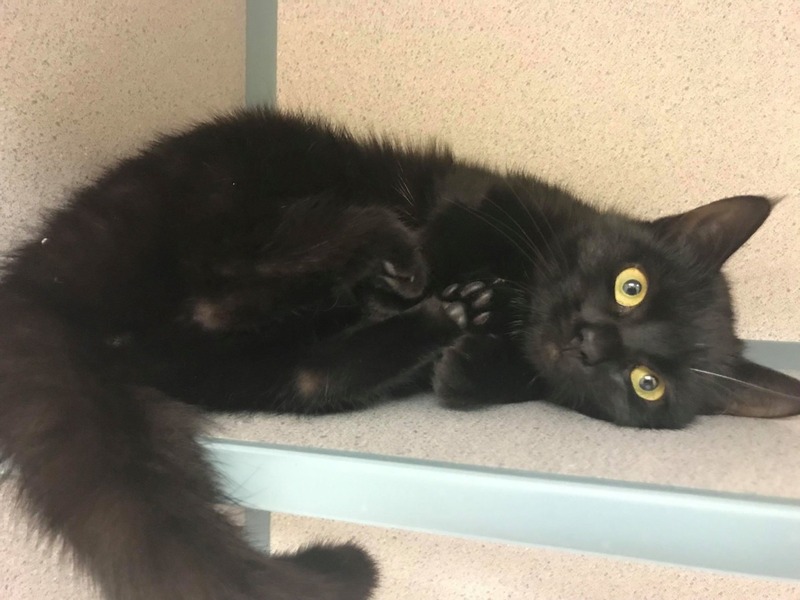 I am also sweet, playful, and sure to make you smile. I love to chase toys and tumble about with my brother Peek, and our antics are a laugh riot. With regard to my background, my siblings and I were born among a colony of cats living outdoors that is being looked after by a couple of very nice humans. While trying to get members of the colony spayed or neutered, the humans scooped us up and helped us become indoor kitties. The humans are now our foster parents, and although they love us and will be sad to see us go, they will be thrilled to see us settled in loving, forever homes. In my foster home, there are kittens, grown-up kitties, and a very mellow little dog, and I get along well with all of them. I hope to be adopted with one of my siblings, particularly Peek, my brother and partner in crime. My other siblings are Jellybean and Vee, and I have a foster brother named Scooter. We are all super cute and would instantly fill your home with love and laughter! 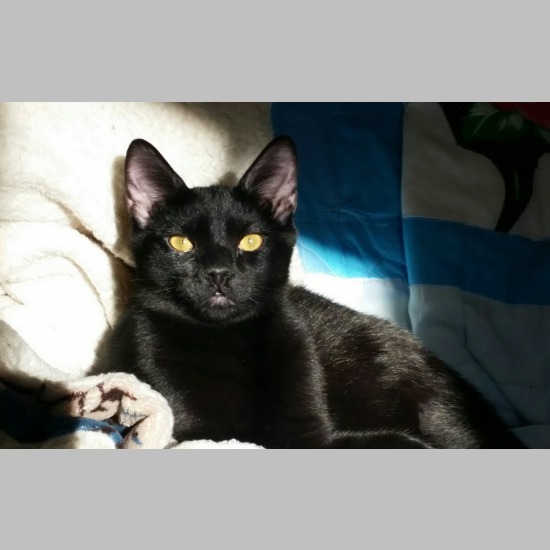 Cinder is spayed, microchipped and up to date on vaccines, including rabies. Angus is the sweetest, smartest little kitten you'll ever meet. He is also pretty small, compared to his litter mates, and might grow up to be a smaller cat. He is a sensitive little fellow and aims to please. Angus loves to play with catnip toys, or climb and chase with his siblings. He also really appreciates getting individual attention from his foster parents, and would like a home where he can get lots of special attention, snuggles, and love! Angus would love to be adopted with one of his litter mates Pansy, Pistachio & Emmett, or his foster brother Dennis. Hey y'all. I am a special kitty. I was born on Harker's Island and I was trying to eat out of a dumpster but I was too small to get in. A nice lady who knew I needed help scooped me up and brought me to Chatham County to live. I am a wide-eyed wonder girl who would love to be your constant companion. I am a happy, healthy girl with a cute little curly tail, and I come with a lifetime supply of the medicine that will keep me happy and healthy. I have a rare form of diabetes but it is under control and I AM FINE! I am spayed, FeLv/FIV negative and up to date on shots. Adoption Pending. Hooray for Robin!. Very much like the boat for which I'm named, I am rugged yet elegant and the perfect example of where feline form meets feline function to perfection. 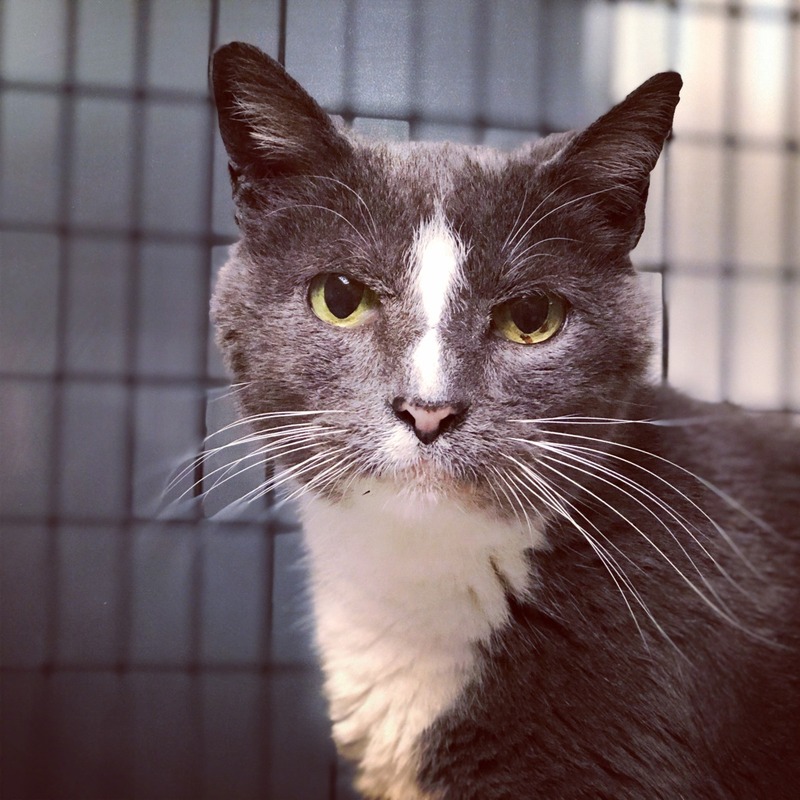 I'm Grady and at a mere almost 14 yrs of age, I am still a very playful, gentle kitty that likes being around people and other kitties, especially the girls. I sniff a lot but the vet tells me I am not contagious. I used to live outside in a very safe environment but am now living inside and it's pretty cool. As a matter of fact, I enjoy living inside. I get to see people all the time and I like that a lot. Interacting with people is even better than birding! People give me lots of rubs, it's really awesome being loved. I am neutered, up to date on my vaccines and negative for FeLv/FIV. Adoption Pending. Hooray for Grady! 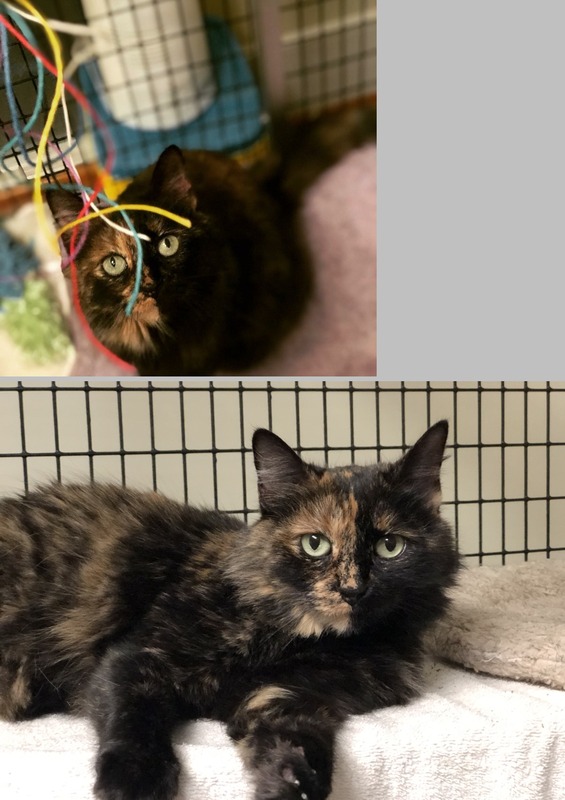 My name is Sweet Pea and I am a gorgeous (if I do say so myself) tortoisehell girl. Just look at me - nature gave me a striking, split screen face that is beautiful and unique. 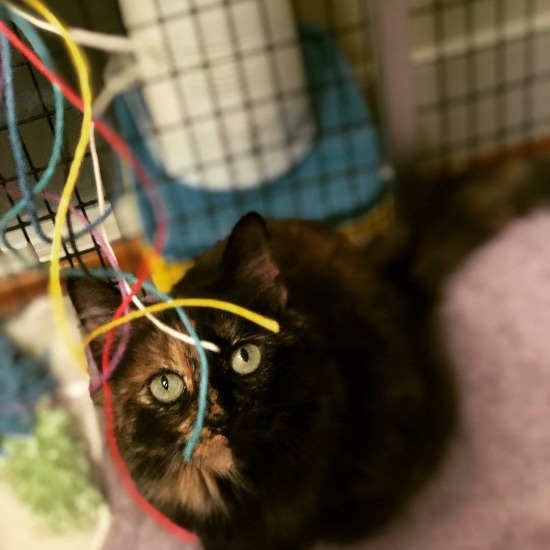 What makes me special (besides my soft fluffy fur and beautiful colors) is that despite being a tortoishell, I have none of that silly "tortitude" that some tortoiseshell cats have that make them a little quirky and sometimes a little cranky. 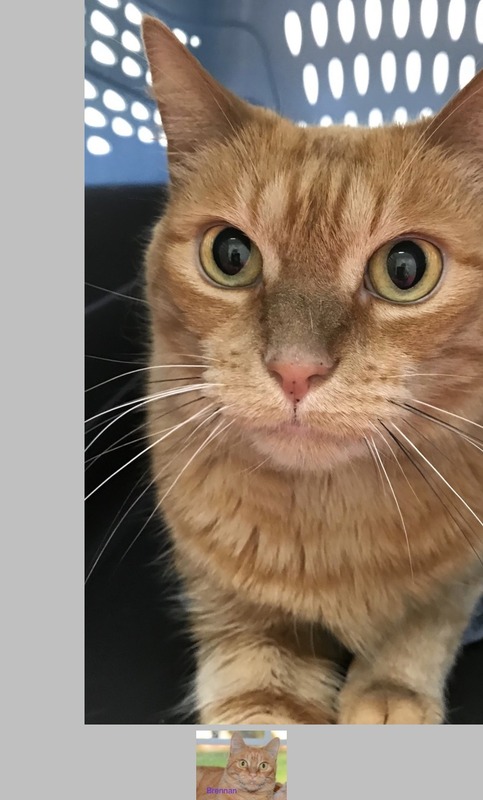 I am a sweet girl and I love to be petted and will cuddle close for more. I miss my mom and am looking for the love I used to get from her. Adoption Pending. Hooray for Sweet Pea! I was abandoned in a foreclosed home a few years ago, along with my brother. My brother has since been adopted and I am looking forward to the same chance at a wonderful home. I am a fantastic, friendly guy who loves to be brushed. In fact, I love being brushed so much that I sometimes drool and leave my tongue sticking out! I also have the cutest crinkly nose when I meow. I live with other kitties and even share some space with the nice, resident dogs. I can be a big LAP CAT, so make room! When you sit, I am there ready to curl up. 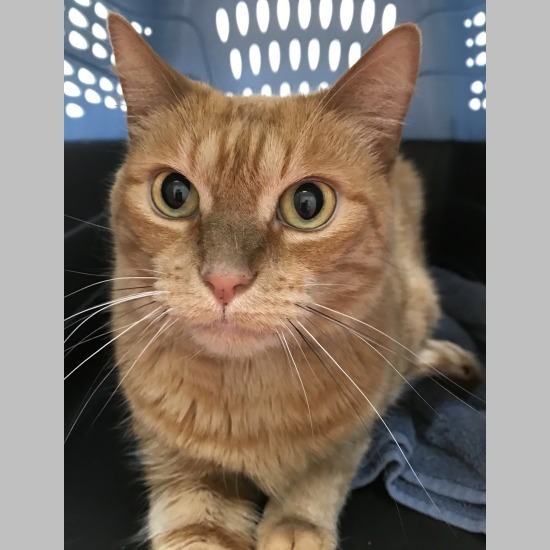 I have had my physical with a clean bill of health so I am all ready for a new home! Adoption Pending. Hooray for Brennan! 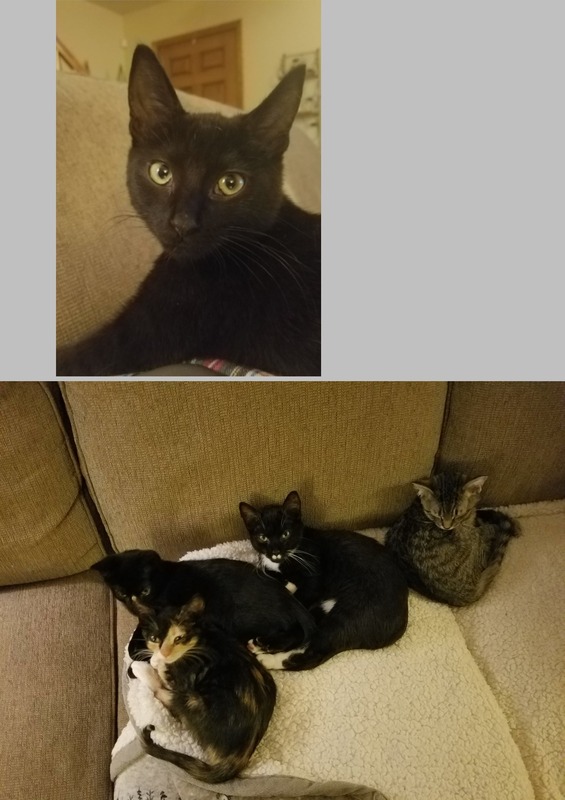 I was surrendered to the shelter along with my four, day old kittens before Hurricane Florence arrived in N.C. I've been busy with the boys (yes, I had 4 sons!) but have had plenty of time to show how loving I am. Oh and by the way, I'm much prettier in person. "They" say I have gorgeous green eyes and a splendid purr! I'm very comfortable with friendly dogs and being inside a house. My veterinarian thinks I'm probably just over a year old. I only weighed 5 lbs when I first met the vet. I had a cold then but am much better and now weigh well over 6 lbs since my boys are eating on their own. 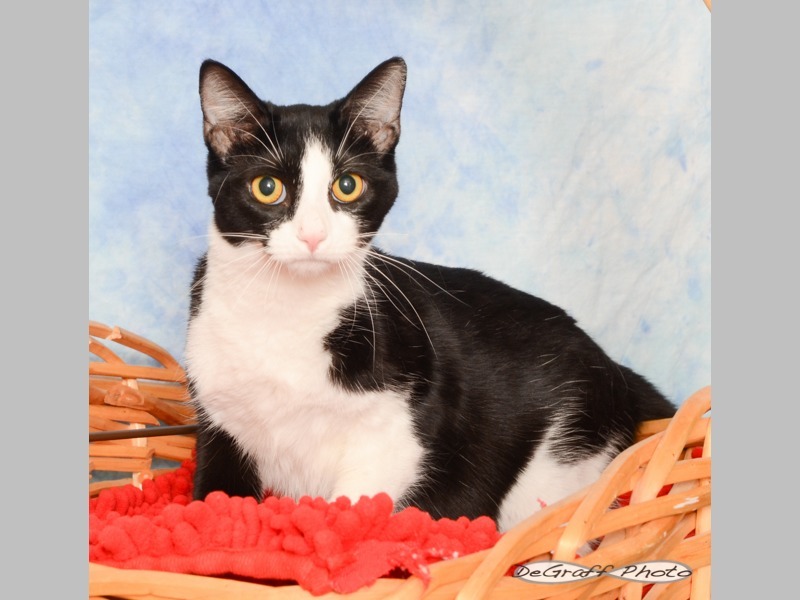 I like to play and am a spunky girl but love being held and settling into a nice, warm lap. Yay for Lady- adoption pending! Brontë is such a sweet, charming boy and is such a lover. 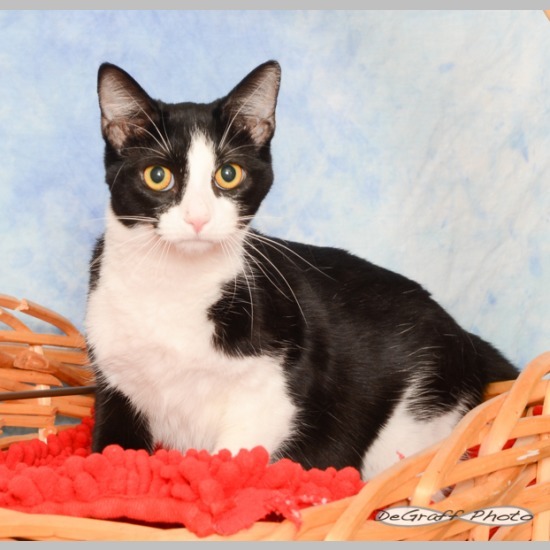 Brontë enjoys snuggling on your lap, loves to be carried and enjoys lounging around. He is the largest kitten from the litter of 6, which were born under their foster parent's shed by a feral mama. He is very long and tall and is STILL growing, so he will be a nice solid adult. He has beautiful glistening black fur and the most wonderful meow. 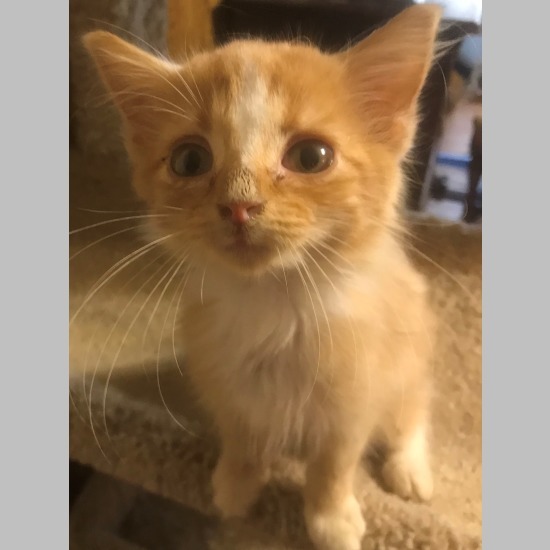 He enjoys playing with his siblings and was the first of the litter to investigate the resident foster dog and deem him acceptable for a playmate. If you enjoy lap kitties, look no further than sweet Brontë. 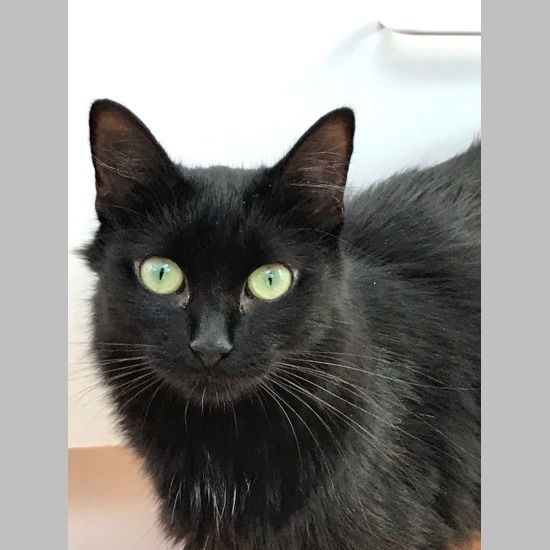 Brontë would do well in an indoor home with another playful cat and even would enjoy the companionship of a cat friendly dog. All children in the home need to be at least 6 yrs or older. Williford T. Pickle. His name says it all. Williford is a lover boy beyond compare! He loves snuggling into your lap, loves kisses, loves cuddles and simply any attention is soaked up by this gorgeous boy! He enjoys playing with his siblings and LOVES, LOVES, LOVES the resident 10lb foster dog. 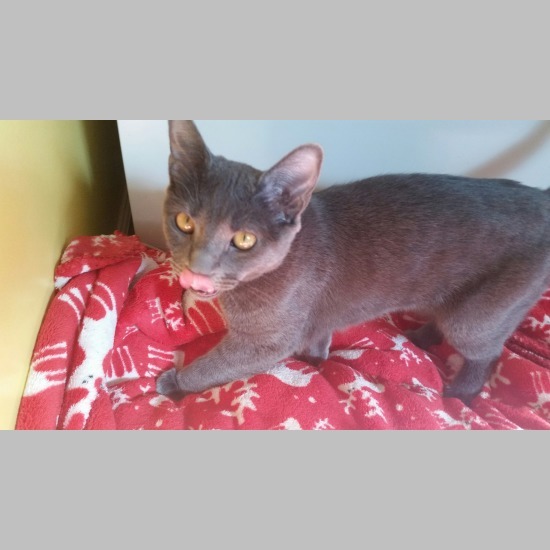 He is a very social little man who will make that special person the most perfect kitty companion. He enjoys snuggling with his foster family on the sofa after he wears himself out by zooming through the house chasing either his siblings or a toy. He is the epitome of what a 6 month old kitten should be: curious, energetic, but calms down easily. 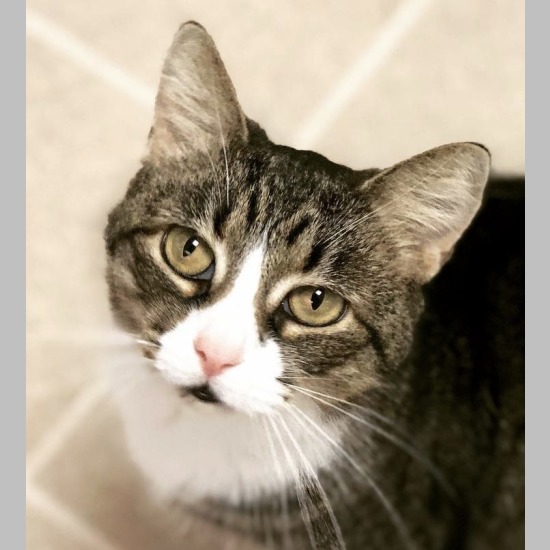 Williford T. Pickle needs an indoor only home and would be best with a kitty playmate and even would enjoy a cat loving canine friend. All children in the home should be at least 6 yrs and older. I will be your sunshine while scampering across your floors which is why my name is Mr. Sunny Scampers. I'm little for my age but I have a big voice (especially when I'm hungry) and I love to purr and cuddle. I'm great with other cats and dogs because my foster family has lots. Let me be your little Lion Star and I will love you furever.